KawaiiPunk - Kawaii Mascot Blog: Donor Dilemma! Zombie Mascot! OK readers, time for another puzzle, and this one’s not only tricky, it’s treaty too! Ha-ha! Yes, it’s a Halloween puzzle! As we all know Halloween is a time for great excitement among many of us and none more so than our very own Zombie Mascot! Unfortunately this year he seems to have got a bit over excited and has been running around so much that his arms, legs and body have fallen off - a none too uncommon problem for zombies :) Thankfully some of the other mascots have kindly helped him out by lending a hand, two hands actually, and a couple of feet, and a body! Naturally the Zombie Mascot is very grateful for his colleague’s friendly gestures, and wants to thank them all in person for their donations. Unfortunately, due to his continued excitement about Halloween, he can’t remember which mascot gave him which body part! What a disaster! 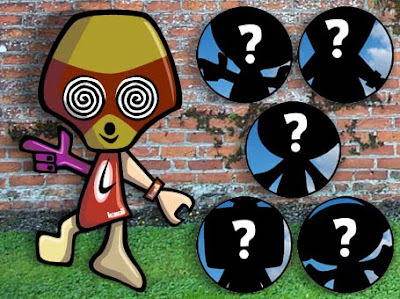 Can you help the Zombie Mascot work out which of his buddies donated which body part? The answer will be revealed in this month’s monthly round-up! Halloween Games! Horror Top Trumps! OMG! Lia? Cute as a Button!